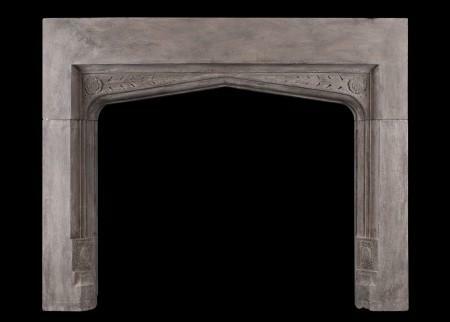 Thornhill Galleries holds a complement of antique and reproduction fire surrounds from the Gothic, Jacobean and Renaissance design eras. 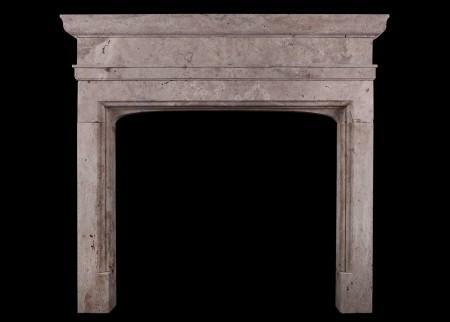 The mantles born from these design periods are perfectly representative of society’s change in taste and style. 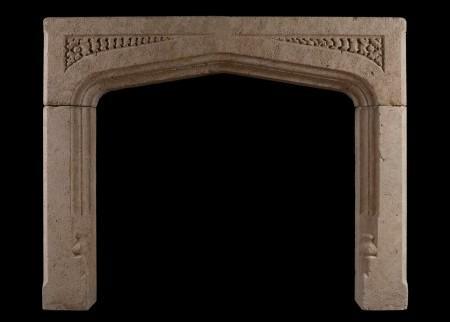 While fireplaces of the Gothic years were grand, vaulted affairs filled with heraldic and ecclesiastical styling, Jacobean and Italian Renaissance chimneypieces took a more classical design approach. 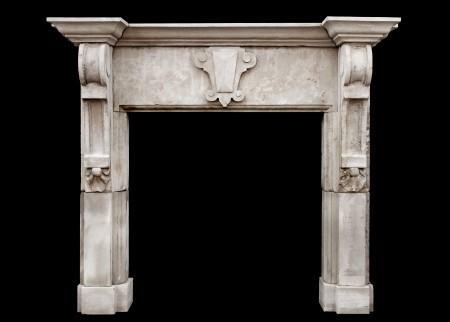 Furthermore, while Gothic and Jacobean mantles traditionally used a combination of limestone and wood to give a sense of imposing grandeur, Renaissance fireplaces introduced marble, stone and plaster, which showcased workmanship rather than scale. 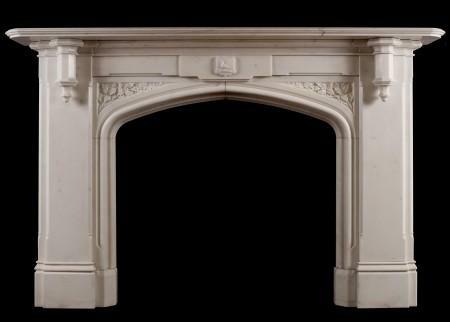 For more information on any of our antique fireplaces, please don’t hesitate to get in touch. 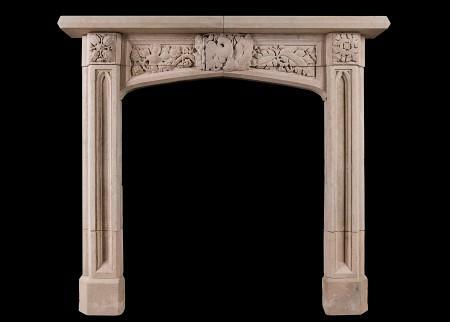 A carved limestone fireplace in the English Gothic style. The diamond shaped frieze with shields and Tudor roses with moulded jambs. Moulded shelf above. A copy of an earlier piece. 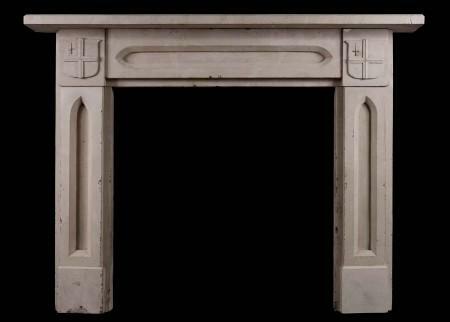 A fine quality 18th century style fireplace carved in Portland stone. 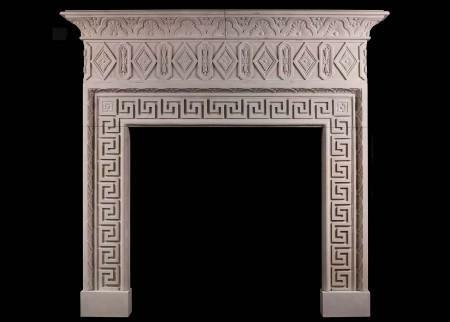 The frieze of isometric design with diamond panelled paterae interspersed with panelled husks, carved with water leaf design to shelf. 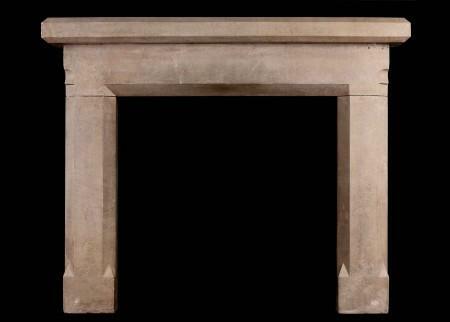 The leg moulding of classical Greek key. A quality copy of an 18th century original which was from a large country house in West Sussex. 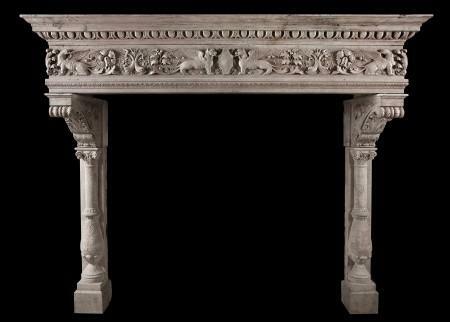 A heavily carved Italian stone fireplace. The frieze with heraldic lion juxtaposed by winged figures, birds and foliage, the jambs with putti, and heraldic figures, urns, stalks and sphynx to base. A copy of an earlier piece. 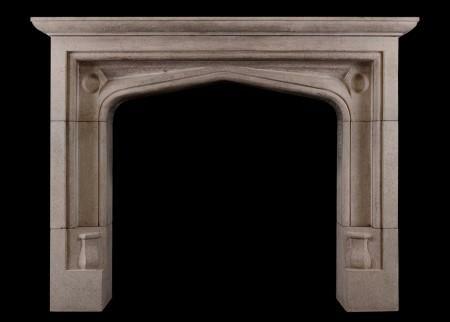 A French Louis XIII style Ancaster stone fireplace, with heavy architectural inner moulding, with shaped scalloped frieze, surmounted by moulded shelf in three pieces. A rustic piece. 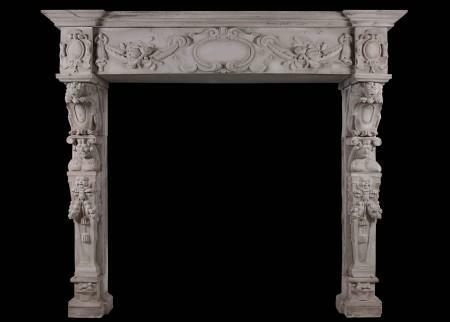 A large and imposing Italian Statuary marble fireplace. 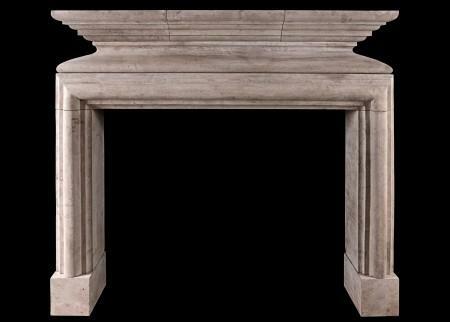 The shaped jambs surmounted by carved rectangular end blocks of floral form. The guilloche frieze with carved paterae and beading. Moulded shelf above. Circa 1900. 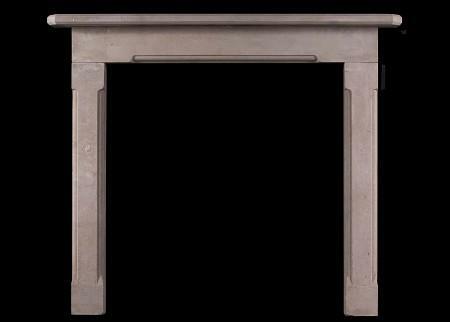 A small English Gothic style fireplace in grey Purbeck stone. 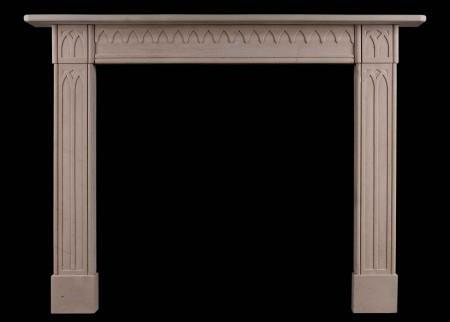 The moulded legs surmounted by arched frieze. English, 20th century. 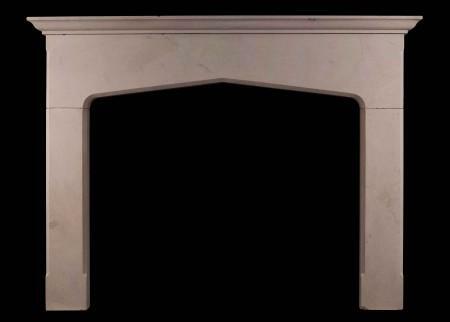 A petite Italian Carrara and Rosso Levanto marble fireplace. 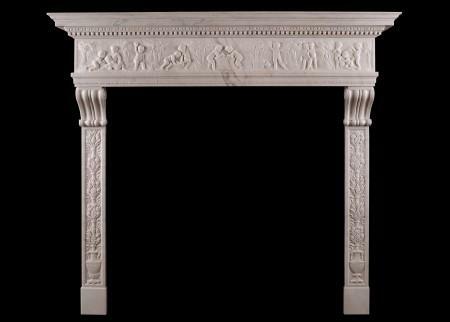 The moulded jambs surmounted by shaped frieze featuring carved classical Anthemion leaf to centre. Moulded shelf above. Unusually small, well suited for a bedroom or study. From Northern Italy. Currently in rustic state but full restoration included in price if required. A fantastic quality Italian Renaissance fireplace in Istrian stone. The carved frieze with shield and winged breasts to centre, flanked by finely carved foliage and tridents. 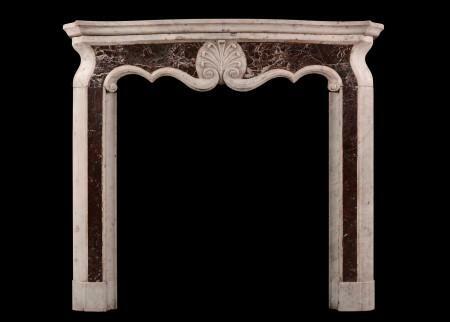 The jambs with delicate leafwork, with scrolled capitals surmounted by acanthus brackets. The moulded shelf with egg-and-tongue moulding throughout. Italian, late 18th century. 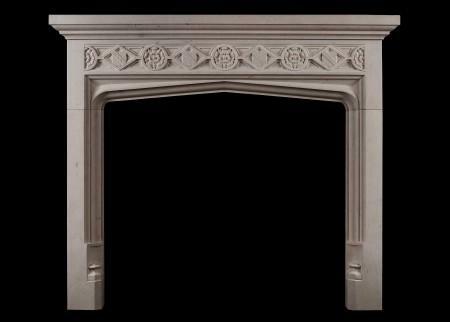 A simple yet elegant Portland stone fireplace with moulding to frieze and jambs. Shaped shelf. English, 19th century. 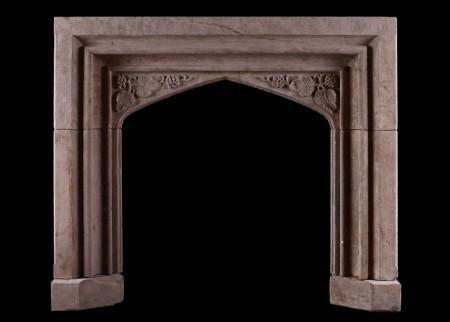 An English stone fireplace in the Gothic style. 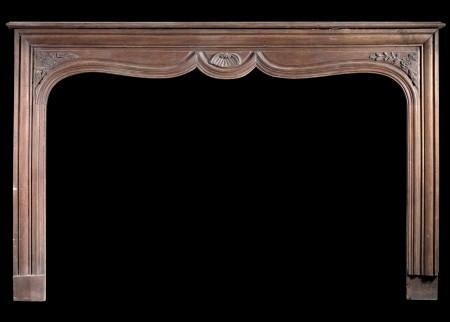 The frieze with moulding detail to ends surmounted by imposing shelf. Early 20th century, possibly earlier. 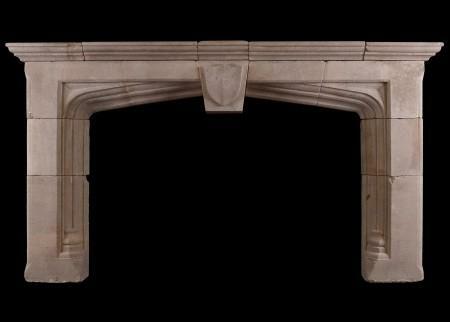 A large English Bath stone fireplace in the Gothic style, with arched opening and moulded shelf. Modern. 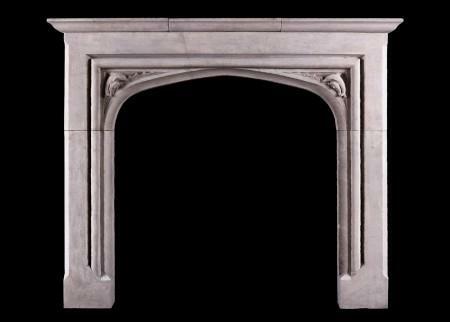 A finely cast stone fireplace in the Gothic style. The shaped legs surmounted by decorative frieze embellished with foliage and plain paterae throughout. Moulded shelf above. English, circa 1900. 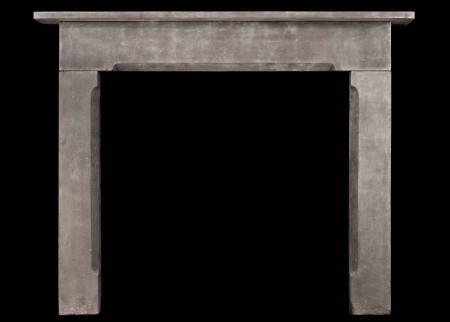 An unusual, shaped oak fireplace. 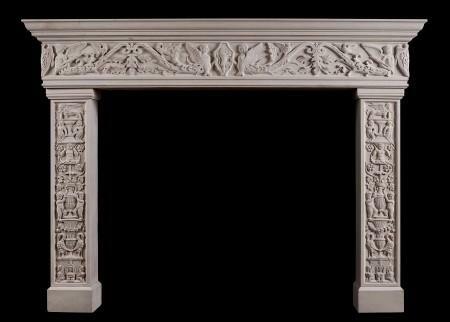 The frieze with carved shell to centre and floral embellishments to ends. Moulded jambs. Photo taken prior to restoration. 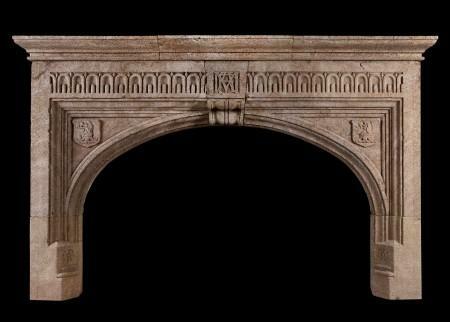 A large, antique English Gothic Hamstone fireplace. 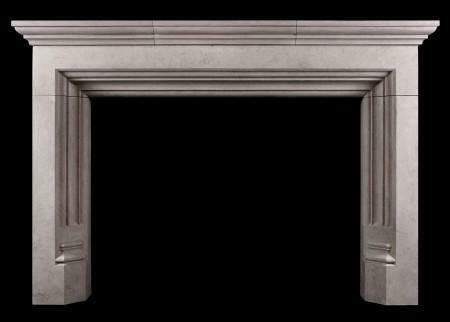 The arched, moulded jambs with crests to centre and carved key stone. 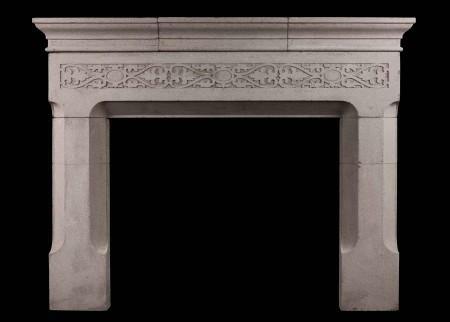 The frieze with stop-fluted arches and central blocking with carved lettering. Mason’s name and date clearly inscribed: “J. Triggs. Mason. 1689.” Stone shelf later. An impressive piece. 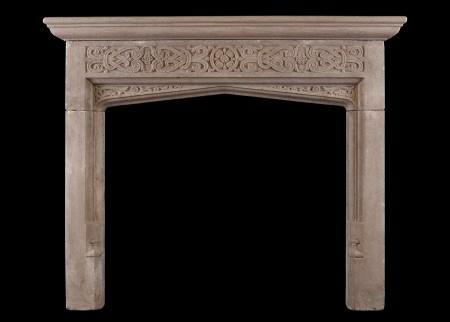 A very rare, 19th century carved stone Renaissance fireplace. The bracketed jambs with crouching lions, ionic capitals, carved male and female masks and basket of fruit to plinths. 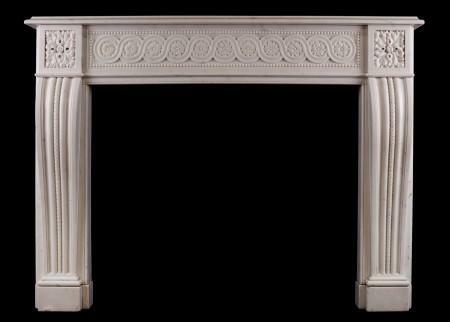 The frieze with carved fruit swags and central scrolled cartouche and associated detailing to side blockings. 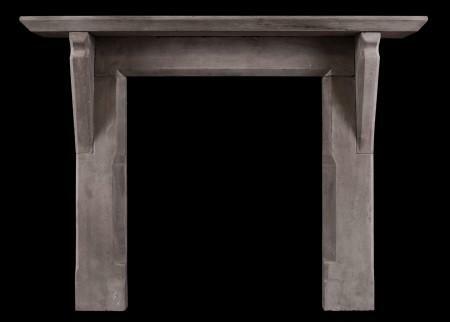 The stone has a grey wash finish with a lovely old patina. Recently removed from a 19th Century property in the European Quarter of Brussels. 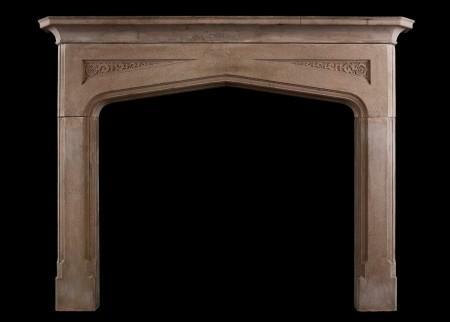 A 19th century English stone fireplace in the Gothic style. The jambs and frieze with recessed panels and end blocking featuring shield crest. Circa 1860. From a large house in Sussex. One of an exact pair.